Silver Anouk Lavender Herb has silvery, gray-green foliage that form a busy mound that stays year round. The blooms are dark purple and have violet petals from the top. You can enjoy the flowers throughout the complete growing season in doors and out. 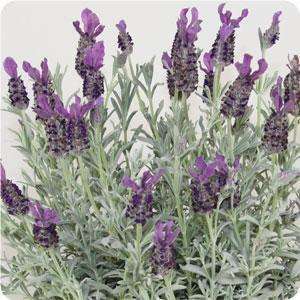 Lavender is a popular scent used in potpourri, soap, lotions and many more naturally scented items. This particular type is hardy to 0 degrees Farenheit but can also be wintered indoors. Cut lavender on long stalks when in full bloom. Tie them together and hang them to dry in a warm dry location. Dried lavender flowers can be used in potpourri and sachets. Lavender oil can be used in many other ways such as flavoring for baking or in cosmetics.